Question: How much does a jointer cost? Answer: Nothing, when you make it out of scrap. Seriously, jointers can run some cash. I saw a reconditioned one awhile back for around $250. It had a 6 inch capacity and was a bench top model. The bench top part of it means it saves on some space, but the 6 inch capacity is a little deflating. Plus a jointer only has one purpose in life. Joint. In a small shop you need your tools to pull their weight and perform multiple functions if need be. I have issues with large bulky machines that only perform one task. My psychiatrist tells me so. My suggestion is to find whatever you have in your shop that will work. The MDF was left over from a 4x8 sheet I have had sitting around for years. Anything stable and resistant to warping would work. The furring strips were cut down from 2x4's that have been left over from previous projects. I have gotten so much mileage out of these furring strips that I now grab every stray piece of 2x4 I happen to see around town. The bolts, washers and wing nuts all came out of my Miscellaneous bin. You know those items you buy and they come with their own mounting hardware. Often times manufacturers will give you several options for mounting. So you end up with left over hardware. That is were these came from. I wouldn't even be able to tell you when or from what these came into my possession. The bolts had a very wide head to them eliminating the need for a washer on that end. Bolts that do not have a wide head should have a washer used with them to help distribute the pressure exerted from the tightening process. This is separate from the washers used on the wing nut side. The holes that are drilled through the base should be somewhat oversized for the body of the bolts used. This gives the bolt some wiggle room so you can get thicker stock under the hold downs. You could also elongate the holes in the arms to achieve the same effect. I have an 8" capacity on this set up with these measurements. A wider jointing capacity could be achieved by widening the base. Also, the length of the base was arbitrary. It could be made however long or short you needed for your needs. Happy DIY'ing and stay safe. I've seen this sort of thing before, and it works pretty well. In my case, though, the real question is how to face joint a board with no jointer. Any ideas? 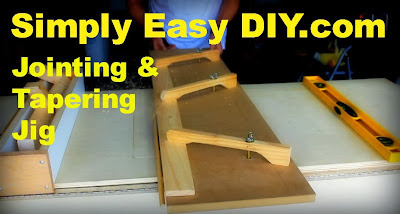 I've been doing that for years with my thickness planer. No need for a jig unless you like over engineering stuff. Place some masking or painters tape on the low spots of a board cup side up. Doesn't need to be perfect just enough to keep the board from rocking when you flip it over cup side down. Run it thru under light passes. Flip the board back over, remove the tape and true the other side. How do you achieve parallel with the other side? You should also consider instead of jumping right into building to explain what you want to end up with and why and how you intend to use it. You don't. The purpose of a jointer is not to create a parallel cut with the other side. The purpose of a jointer is to make one side straight and true so that you can take the board from the jointer to the table saw. Then you can run the straight side against the table saw rip fence to make a parallel cut for the other side. As far as the rest of your comment goes, Youtube gives me the ability to see what people are watching and what they tend to fast forward through. Explanations of what, why and how tend to get fast forwarded through. Too much information or not enough? It is a fine line to walk for sure. Unfortunately I can't produce videos where everyone will love everything about them. That is why I produce a blog post to go along with every video. Those that just want to be entertained and enjoy a project build has the video. Those that want more information have this website and my full support and attention. Perhaps you are misunderstanding what the jig is suppose to do. You don't make a parallel cut with the other side. That is not what this jig does. That is what your rip fence on the table saw is for. This jig simply makes a straight cut on one side of a work piece which is exactly what a jointer does. In woodwork speak it joints an edge. You then set your rip fence up to 3-1/2" and rip it to width. It is the same process you would use if you had an actual jointer in your shop. I guess I don't understand why someone would want to try and rip with this jig? With your set up can you face a 2x4? I use a lot of construction grade 2x4 and this would be nice to get a square face to start with. Any suggestions how this can be done. I thought about using longer bolts.